Nothing compares to the cackling sound of a fire on a chilly night. Real wood logs exude such a welcoming and fresh scent into the home. Storing logs can be more difficult though. Unless you live in a log cabin somewhere in the woods, a pile of logs on the floor probably doesn't suit your patio or garage. With this tubular steel log rack, you can display your logs, and keep them free from any bugs or insects. The log rack comes coated with a black, rust-resistant paint. This rack comes complete with all assembly hardware, and is very easy to assemble. What is the weight of this log rack? This product weighs 15 pounds. With the money I saved by purchasing this sturdy rack, I was able to buy a cover to keep the moisture off. It holds about one-fourth of a cord of wood, which is just the amount we need at a time. The delivery of this log rack was incredibly fast. I had no problems putting it together, and it matches its online description perfectly. I really like this product. I'm very pleased with the fast shipping, ease of assembly, and the quality of the product. The rack fits perfectly with what I was looking for. It is a really good product at a great price. I've seen this log rack elsewhere for twice the price! It only took me five minutes to assemble. The cover is nice, but priced a little higher than necessary. This rack is just what I needed. It arrived quickly, and assembly was a simple process. The only way I can think of to make this rack easier to assemble is to buy it already assembled! Due to the reasonable price, I purchased three racks. They were very easy to put together and though they are lightweight, they are strong enough to hold a lot of wood! This item is a great buy. The log rack arrived within 48 hours of purchase and is exactly as described. This was a great investment. My rack easily holds a half cord of lumber. Its construction is solid; I really like it. This wood rack is just as advertised and was shipped quickly. Though we haven't had ours for very long, so far it is holding up well under three-foot logs. I love the fact that this sturdy log rack fits so nicely on my patio without taking up too much space. I would recommend it heartily. Our log rack arrived sooner than we expected and in excellent condition. It is sturdy enough to hold our heavy logs. We also purchased the cover which has handy Velcro closures to keep the wood extra dry. This is a great product, and I appreciate the fast shipping. This product arrived in record time. We are very happy with the wood rack and the customer service we received. The craftsmanship of this product is quite good, and it is very simple to use. I highly recommend it. We got our wood rack very soon after ordering. It was simple to build, is sturdy, and holds a lot of wood. My log rack arrived sooner than estimated. I had no trouble assembling it quickly and have found it to be plenty sturdy. The pricing of this item was quite reasonable, and I appreciated the prompt delivery. It was very easy to put together. Because I use a wood stove for supplemental heat, I needed the convenience of an indoor storage solution for my wood. 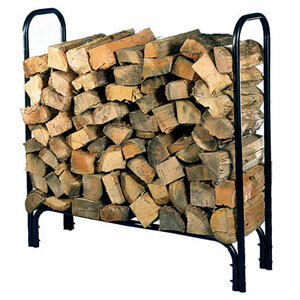 This log rack looks nice enough to use indoors, holds plenty of wood, and is plenty strong. It arrived quickly after I placed the order, too. Our wood rack came quickly. My husband was so excited that he assembled it immediately and loaded it with wood. We are very pleased. This rack is a huge improvement over what we used before: a simple tarp. Now our wood stays up off the ground on a sturdy, attractive log rack which was easily assembled. My rack was delivered quickly. I set it up easily and now have a nice, neat wood stack. Our rack is used in our rustic living room. It holds several days' worth of wood, which dries properly before it is used for fuel. It is working out very well. This rack arrived just in time to hold the wood I ordered, and I was able to put it together super fast. Thanks!